Last night I got in touch with my lifelong friend, Rob Mackie. It's been a long time since we fished together so after looking at a weather and tide report we decided to make a go of it in the early morning. He met me at 5:30 am and after a quick launch we were on the water before 6. It was a really nice morning despite the rain for the past couple days. However, the fog was thick and navigation all the way to Sandy Hook was difficult. Luckily I had made this same trip a few days ago and had a nice trail to follow on my GPS map. We just had to be careful not to run into any other floating objects in the water - or other boats. The fog stayed with us for most of the early morning. 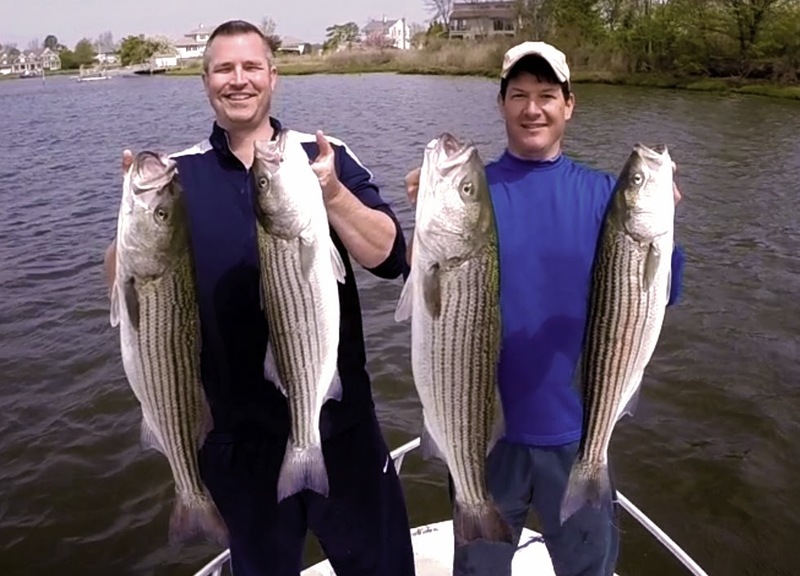 When we arrived at the "spot" we started trolling the bunker spoons - as this was a proven method for landing big stripers this time of year. It didn't take long before we got a hit and landed our first of the day. It's really nice to catch a fish early. It takes the pressure off for the rest of the day. Rob and I just cruised around the same location for a few hours having a good time talking about the past, present and future. Before we knew it we had our limit of 4 keepers in the boat and it was time to head home. We were back by 11 am after a full and productive day of fishing. When the sun finally came out we took a few photos with our catch. I'll wake up early for this kind of success any day. I packed my 2 fish in ice with the intention of cleaning them tomorrow. My supply of fish is growing and it's almost at maximum capacity. I don't like to freeze fish if I don't have to because I don't like what it does to the meat. Instead, I am going to smoke a lot more than I usually do. It keeps very well in this cured state and is very portable and snackable. Later today I took the kids out for lunch to one of their favorite spots - The Kitchen Witch. It was challenging to sit there and watch them eat delicious looking food right in front of me while I had my water. The waitress gave me lemon with my water. I took advantage of the situation and enjoyed a little lemon. 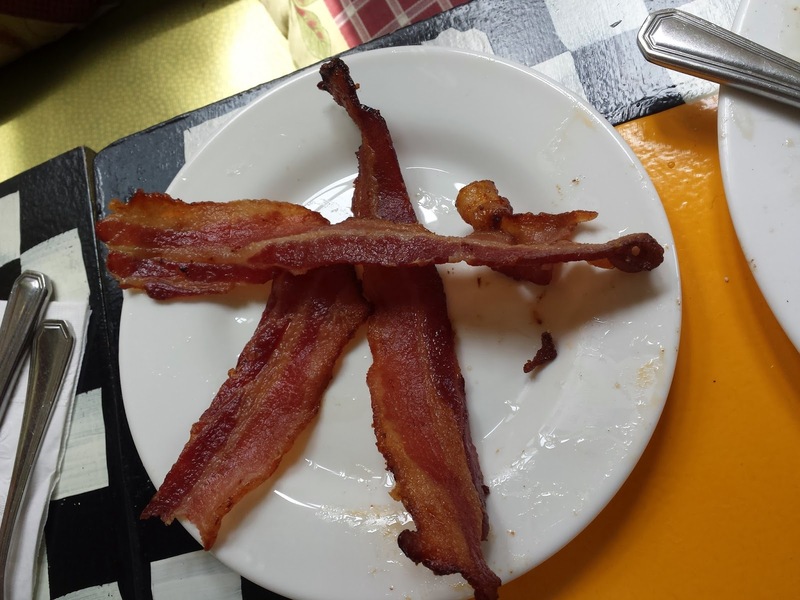 Ty ordered french toast with a side of bacon. This bacon was so thick and perfectly cooked. It smelled out of this world. There was so much that Ty couldn't even finish it all and instead of taking it to go - to have the next morning re-heated - he refused it and left it on his plate to be thrown away. Oh - this drives me batty. The waste! I had to take a picture. This kid wastes more food than a small country. After lunch we took a trip to the mall to look for some Mother's Day gifts (which is tomorrow by the way). The mall had a host of it's own culinary temptations for me around every corner. And then it was Costco later in the day - free samples of food abound. This day really challenged my will power. I survived it though. Tomorrow - well that will be a different story. . .
"FOR"Defined: In order to obtain, to gain or acquire. Matthew 26:28 for this is My blood of the covenant, which poured out for many for forgiveness of sins. Jesus shed His blood "for" the forgiveness of the sins of all those who obey His terms for pardon. "For" means in order to obtain forgiveness. "For" did not mean that Jesus shed His blood because the forgiveness of sins had already been granted. Acts 2:38 Peter said to them, Repent, and each of you be baptized in the name of Jesus Christ for the forgiveness of your sins; and you will receive the gift of the Holy Spirit. Peter told them to repent, and be baptized "for" the forgiveness of sins. Peter did not tell them to repent, and be baptized because their sins had already been forgiven. "For" means in order to obtain. "For" does not mean already has obtained. Although "for" is not stated in all of the follow Scriptures. "For" is certainly implied. Grace and faith are "for" salvation. In order to obtain salvation, grace and faith are essential; grace precedes salvation and faith must precede salvation. John 3:5 Jesus answered and said to him, "Truly, truly, I say to you, unless one is born of water and the Spirit he cannot enter the kingdom of God. Being born of water and the Spirit are "for" entry into the kingdom of God. You must be born of water and the Spirit in order to obtain entry in the kingdom of God. You are not born of water and the Spirit because you are already a member of God's kingdom. God's mercy is "for" salvation. The washing of regeneration (that being water baptism) is "for" salvation. Renewing by the Holy Spirit is "for" salvation. God's mercy, the washing of regeneration (water baptism), and renewing by the Holy Spirit are all in order to obtain salvation. God's mercy precedes salvation. You are not baptized because you are already saved. You are not renewed by the Holy Spirit because you have already been saved. Confessing Jesus as Lord is "for" salvation. Believing in your heart that God raised Jesus from the grave is "for" salvation. Confessing Jesus as Lord and believing God raised Him from the dead is in order to obtain salvation. You do not confess Jesus as Lord and believe God raised Him from the dead because you have already been saved. Mark 16:16 He who has believed and been baptized shall be saved; but he who has disbelieved shall be condemned. Believing is "for" salvation. Being baptized is "for" salvation. Belief and water baptism are in order to obtain salvation. You do not believe because you have already been saved. You are not baptized because you have already been saved. Although many claim that the "for" in Acts 2:38 really means "because of" there is not one translation that I know of that translates it that way.